The Royal Challengers Bangalore vs Kings XI Punjab match today at the Chinnaswamy Stadium was always going to be a low-key affair given that both teams have little to no chance of qualifying for the playoffs. However, the match did not fail to throw up some memorable moments. After winning the toss and opting to field, RCB started brightly, picking the big wicket of Hashim Amla in the very first over of the game. In quite bizarre circumstances, Amla walked off immediately after trying to play a cut to a ball pitched outside off from Aniket Choudhary, despite no one sensing the faint nick or going for an appeal. However, the most ‘bizarre’ moment of the evening was to follow soon after. In the 10th over of the innings, Chahal delivered one that drifted in and turned away substantially after pitching. Being foxed by the drift, Saha stepped down the track to turn it over to the leg-side, only to play around the ball and be left stranded way outside the crease as the ball spun past the outside edge. However, the ball went on to evade not just the bat but also the keeper’s grasp. 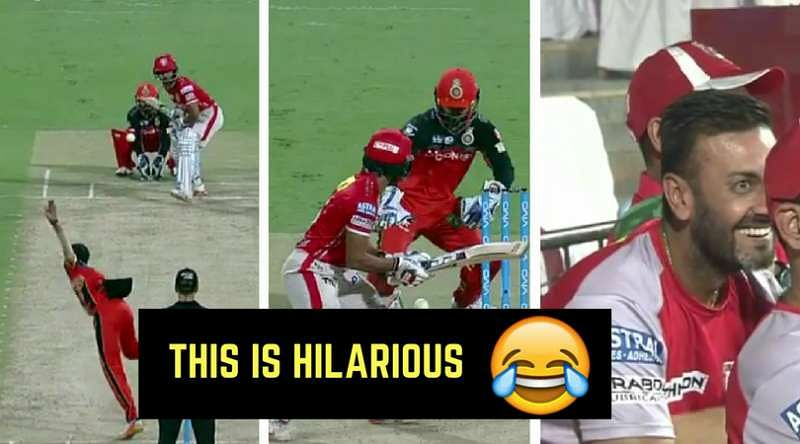 RCB’s makeshift wicketkeeper Kedar Jadhav put himself in an embarrassing position when he first failed to collect the ball cleanly and then fumbled while trying to deflect the ball towards the stumps. At this stage of the match, Kings XI were in real trouble, having lost their three key overseas batsmen – Amla, Guptill and Marsh – with not many runs on the board. RCB had started impressively by keeping the run rate down to less than six runs per over and bagging three wickets for 53 at the end of nine overs, when Saha arrived at the crease. Losing him at that point would have seen Punjab crumbling rapidly. However, Saha made full use of his reprieve and formed a crucial 34-run partnership for the sixth wicket with Axar Patel, who played a cameo of 38*(17) that lifted Punjab to a more respectable score of 138. The innings of 21(25) from Saha was not spectacular by any means but it steadied the ship for Punjab after a top order collapse. This was further proof of why Jadhav lags behind many of his colleagues when it comes to being a potential candidate for the role of India’s keeper. Funnily enough, it was Saha, widely viewed as one of the most technically sound wicketkeepers in the country, who was the beneficiary. While Jadhav has done a stellar job for India in recent series, even turning his arm over effectively, his glove-work has been shoddy in the IPL and leaves a lot to be desired. Though not viewed as a specialist wicketkeeper in international cricket, RCB have utilised his services in order to lend greater depth to their team. 0 Komentar untuk "SK Epic Cricket Fails: Kedar Jadhav makes complete mess of easy stumping opportunity"